No blisters or wet farts, at least until after the race. Yet, yesterday's The Performance Series Race at Stadium Riverside Walk was one of my worst half marathon performances. I did stop to take a leak, though, at the same toilet I used during the Income Eco Run three weeks earlier. That toilet at the Gardens by the Bay East entrance is a life-saver. My legs felt stiff throughout the race. I usually hit the wall around the 14km mark. This time, it was 7km. Previously, I would avoid drinking anything during a race. This time, I was looking forward to the next hydration point so that I could get a cup of cold, refreshing, delicious Lucozade, which tasted much better than last year's awful orange-flavoured version. After getting "hydrated", I would feel too bloated to run. So once again, i walked for much of the last few kilometres, which accounted for my lousy time, 2 hours 55 minutes. So what's my excuse this time? Not enough sleep. some lingering pain from a leg injury and satay rendang pizza for dinner the night before. But honestly, I should just face the fact that I have been undisciplined in my training and I'm just not fit enough. 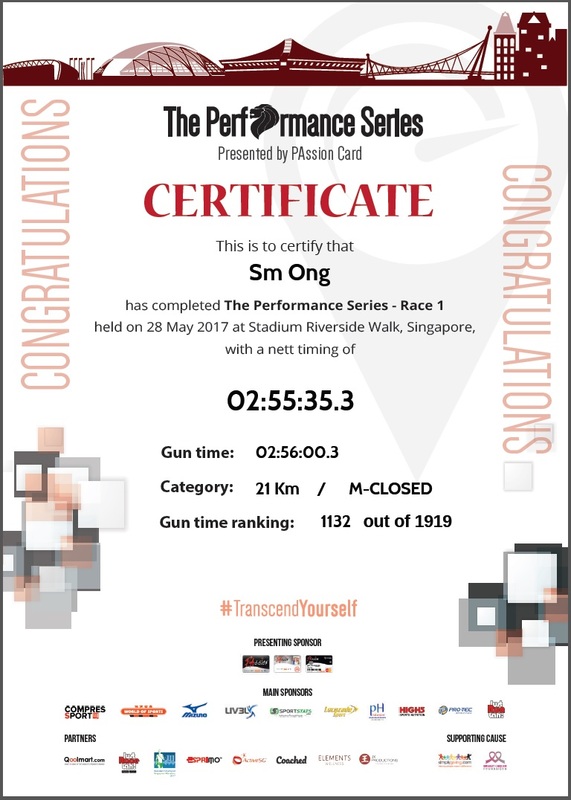 At one point during the race, I asked myself, why am I punishing myself like this by signing for these 21km races? I'm not getting any better at it. After half a dozen half marathons, it's still not getting any easier. Unfortunately, I've already signed up for three more this year, including the Army Half Marathon. I swear, after this year, no more half marathons. But then, that was what I said two years ago.